With the release of version 3.8, I’ve recompiled the most recent code that has been posted to the GitHub project. This version includes some bug fixes, “theoretical” support some hardware keys from HP and Lenovo, and support for high DPI displays. With the release of version 3.7, I’ve recompiled the most recent code that has been posted to the GitHub project. This version includes some bug fixes, “theoretical” support for triple byte keys and the Alt+GR key, and support for saving/loading the entire list of key mappings to/from a file. This feature has been asked several times but I’ve always directed people to export/import directly from/to the Registry using REG files but since it comes up often enough, I decided to add a couple of buttons to the UX. Save keys writes out the binary data represented by whatever keys are in the list and puts that information into a binary SKL file. 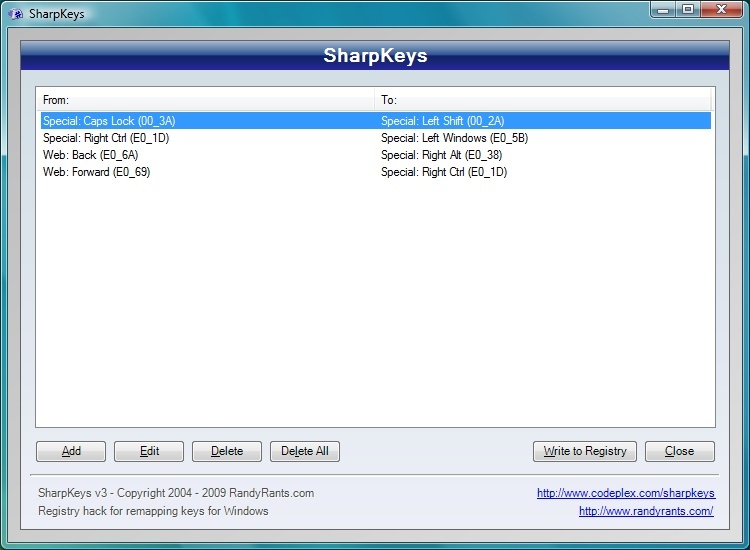 This file can then be read back into SharpKeys using the Load keys button and selecting the stored SKL file. Please remember that regardless of how you build your list of key mappings – Add/Edit or Loading an SKL file – you’ll still need to write the changes to the Registry and then either sign in/out or reboot for the changes to take hold. With the move to version 3, I’ve decided to release the source code to the public via Codeplex, so that the developer community can actively enhance and support SharpKeys – if I decide to work on future versions, it will be along side anyone else that has dipped into the source code. My hope is that the list of available keys will grow to include more international options and that other random asked-for features get added as people require them. I will continue to host a copy of 3.0, as that’s the most current copy, but I’m going to ask that all support requests go through Codeplex – this will allow other people to help with new features, going forward. The source code can be found at http://www.codeplex.com/sharpkeys – enjoy! 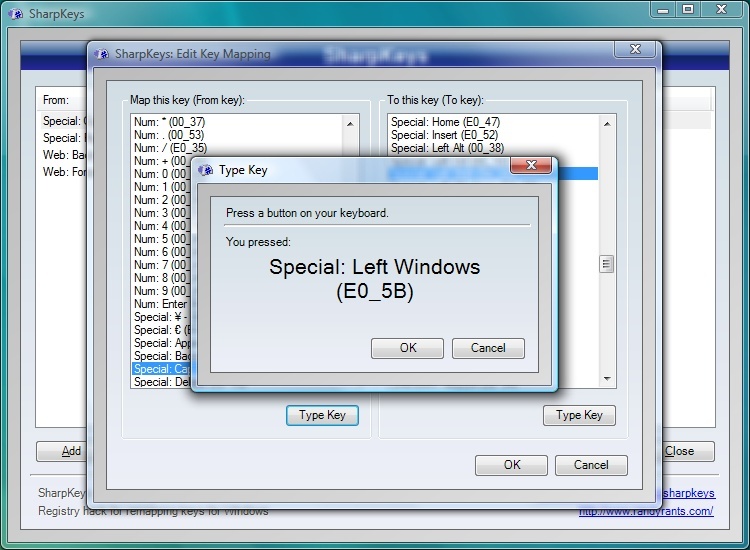 SharpKeys is a Registry hack that is used to make certain keys on a keyboard act like other keys. For example, if you accidentally hit Caps Lock often, you could use this utility to map Caps Lock to a Shift key or even turn it off completely. This official release includes support for up to 104 mappings, an extensive list of available keys, and a “Type Key” option to help when managing mappings. As it relies on internal support within Windows NT, Windows 2000, Windows XP, Windows Server 2003, or Windows Vista you must be running one of these OS’s for this Registry hack to work. As a minor update from 2.1, version 2.1.1 addresses the new user security that is active in Windows Vista Beta 2. You’ll no longer have to explicitly run SharpKeys as an Administrator as you will automatically be prompted to do this whenever you run SharpKeys. 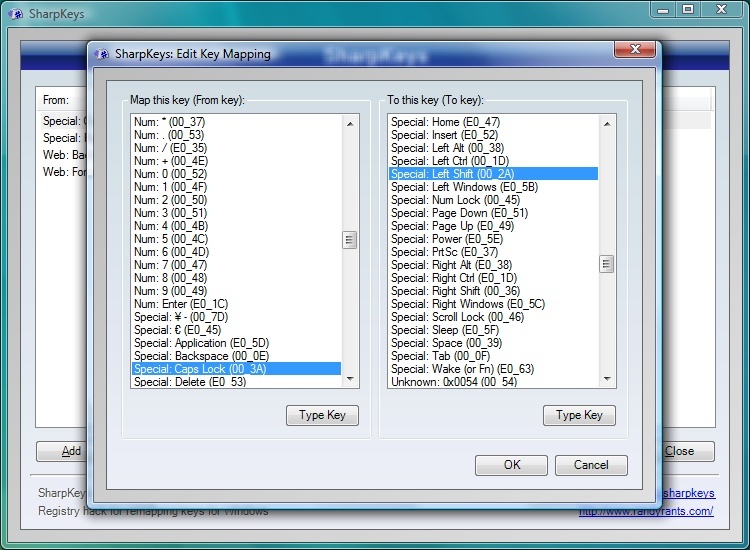 For what it’s worth, this requirement is not SharpKeys’ fault: of the registry keys that SharpKeys needs for itself are stored in a part of the registiry that you will automatically have access to… it is the registry editing that SharpKeys performs for Windows that requires elevated access to work with. This download is not required for users that are not running Windows Vista; nothing else has changed in this release. SharpKeys is a Registry hack that is used to make certain keys on a keyboard act like other keys. For example, if you accidentally hit Caps Lock often, you could use this utility to map Caps Lock to a Shift key or even turn it off completely. The official release includes support for up to 104 mappings, an extensive list of available keys, and a “Type Key” option to help when managing mappings. As it relies on internal support within Windows NT, Windows 2000, Windows XP, or Windows Server 2003, you must be running one of these OS’s for this Registry hack to work.